This activity is intended to supplement the "Wave on a String" PhET simulation. 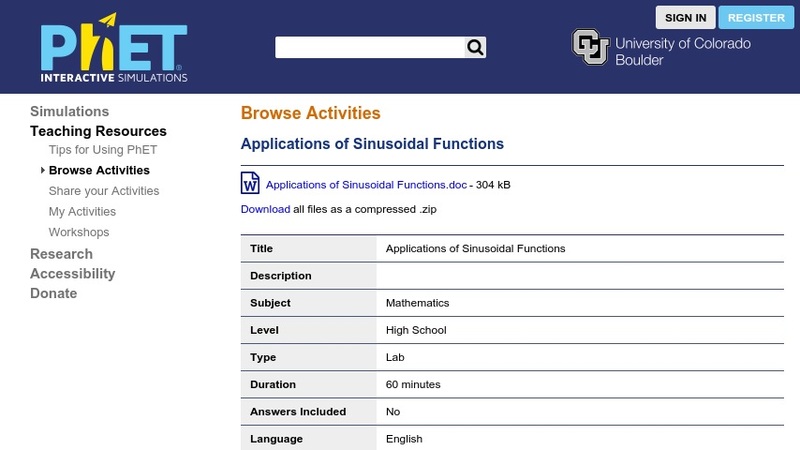 Students apply the concepts introduced in the computer simulation to explore properties of sinusoidal functions. They will find an equation of a wave with pre-set components and analyze how amplitude, frequency, and tension influence changes in the wave motion. The activity is intended to take ~60 minutes to complete. The wave simulation, which must be open and displayed to complete this activity, is available from PhET at: Wave on a String. This lesson is part of PhET (Physics Education Technology Project), a large collection of free interactive simulations for science education. (+) Use inverse functions to solve trigonometric equations that arise in modeling contexts; evaluate the solutions using technology, and interpret them in terms of the context. ?